In January, at the World Economic Forum in Davos, Switzerland, President Xi Jinping of China called his country a champion of free trade and globalisation. And at an international conference in Beijing in May, he laid out China's grand vision of promoting global integration by linking Asia, Europe and beyond through a new network of roads, railways and sea routes. Sceptics have derided the notion that China, which has resisted dropping the many barriers that restrict the free flow of goods and capital across its borders, is suddenly all-in on globalisation. But this criticism misses the bigger picture. This form of multilateralism is built on transactional principles very different from the type of global order that the US and other Western economies have championed, one built on trust and mutual cooperation. It will eschew values such as democracy, human rights and freedom of expression, which the US has long sought to promote around the world. Beijing's strategy has two main prongs. The first is to change the rules of the game from within, by expanding Chinese influence in existing international institutions. China joined the World Trade Organisation (WTO) in 2001, committing to opening its markets to foreign goods and investment in return for better access to markets worldwide for its own exports. China did indeed benefit, kicking its manufacturing machine into high gear and boosting its exports. But the other side of the bargain - the opening of Chinese markets - was not fulfilled. Foreign exporters and investors still face many barriers in China. To sell goods there, foreign companies often have to sign up with local partners. Foreign businesses undertaking production in China also have to partner with local companies, requiring transfers of technological expertise and intellectual property. Foreign investment is still restricted in certain sectors, including financial services such as insurance. Meanwhile, China has become the second-largest economy and one of the biggest traders in the world, allowing it to hold sway within the WTO. The country is now one of the prime users of the WTO dispute-settlement process, which it uses to protect its own interests and to aggressively counter trade actions brought against it by other countries. With its rising economic clout, China has also been able to increase its voting shares at international financial institutions such as the International Monetary Fund (IMF) and the World Bank. At these organisations, the US and other advanced Western economies together still have the dominant voting power. So, China has been subtle in its approach, creating alliances with other emerging-market countries such as India and Russia to advance its priorities. The second prong of China's strategy involves setting up its own international institutions. These put a multilateral sheen on projects in which Beijing controls the purse strings and also sets the rules of the game. Moves such as the Belt and Road initiative - a plan to invest US$1 trillion (S$1.3 trillion) or more in transcontinental infrastructure - and the Asian Infrastructure Investment Bank (AIIB), which started operations last year, allow Beijing to cloak its influence behind the facade of a large group of countries, all with ostensibly significant roles in running these institutions rather than a position that requires them to follow Beijing's commands. When China wants to show off its raw economic power, it can put on quite a show. The Belt and Road conference held in Beijing in May drew nearly 30 national leaders from four continents, an array of former heads of state, and numerous leaders from major public and private financial organisations. The gathering will some day be remembered not for who attended or for how much money was put up, but rather as a display of the Chinese strategy to expand its geopolitical influence. The professed multilateral nature of its initiatives allows Beijing to pull other countries more tightly into its fold. It becomes harder for countries that do not share China's values to stay on the sidelines. Many countries joining with China say they must do so to influence these new institutions from the inside rather than just complain about them from the outside. This was the justification when Britain, Germany and France signed up to become founding members of the AIIB, leaving the US fuming. China has also been effective at pulling potential geopolitical rivals into its economic embrace. Countries such as India and Russia are competitors in many areas. But Beijing has corralled these and two other major emerging-market economies, Brazil and South Africa, into economic alliances. In addressing concerns that the institutions it is setting up will lead to low standards of governance, transparency and efficiency, Beijing has declared that it will uphold, and even improve upon, the standards set by Western-led institutions. Consider the governance structure of the IMF and World Bank. In both organisations, an 85 per cent supermajority is needed to approve major policy decisions. The US, with its voting share of about 16 per cent, in effect has veto power, which gives it outsized influence over decisions such as which projects and countries the institutions fund as well as the conditions attached to the funding. The dominance of the Western economies and their world view, with the US seen as the economic hegemon and the paragon of free markets and democracy, meant that this arrangement once gave these organisations legitimacy and power. However, in recent years, with the declining economic power of the West and the rising clout of China and other emerging-market economies, this situation has in fact eroded the legitimacy of such institutions. In contrast, at the AIIB, China has a 28 per cent voting share and no veto power. However, unlike at the IMF and the World Bank, approval of major policy decisions at the AIIB requires only majority support. It is hard to imagine the bank making any decision against China's wishes. Yet, on paper, this structure beats one in which the dominant country has unbridled veto power, a situation that now rankles other members of the IMF and the World Bank. For its lending through the Asian infrastructure bank, China has indicated that it will choose only projects that meet the highest standards in terms of corporate governance, environmental impact and commercial integrity. Yet, unlike financing from the US or from Western-dominated aid and financial institutions, Chinese-led projects rarely come with obvious strings attached. With this approach, China avoids sensitive political issues that could irritate loan recipients. Beijing does not bring up uncomfortable subjects such as corruption, freedom of expression, democracy and human rights. In December 2015, President Xi attended a meeting of African leaders in Johannesburg. He arrived bearing nearly US$60 billion in loans, loan write-offs and other forms of financing. Then, to the delight of the leaders, including the many despots in attendance, he uttered words that were music to their ears: "China supports the settlement of African issues by Africans in the African way." China's strategy amounts to a systematic displacing of a multilateral system that was built on high ideals and trust, mainly of the US but also of other advanced economies. Institutions such as the IMF and the World Bank were meant to improve national economies and global cooperation rather than propagate the power and influence of any particular country. While the US benefited from its outsized role in these institutions, the values that Washington espoused, such as free markets and democracy, were seen as benefiting economic and human welfare around the world. 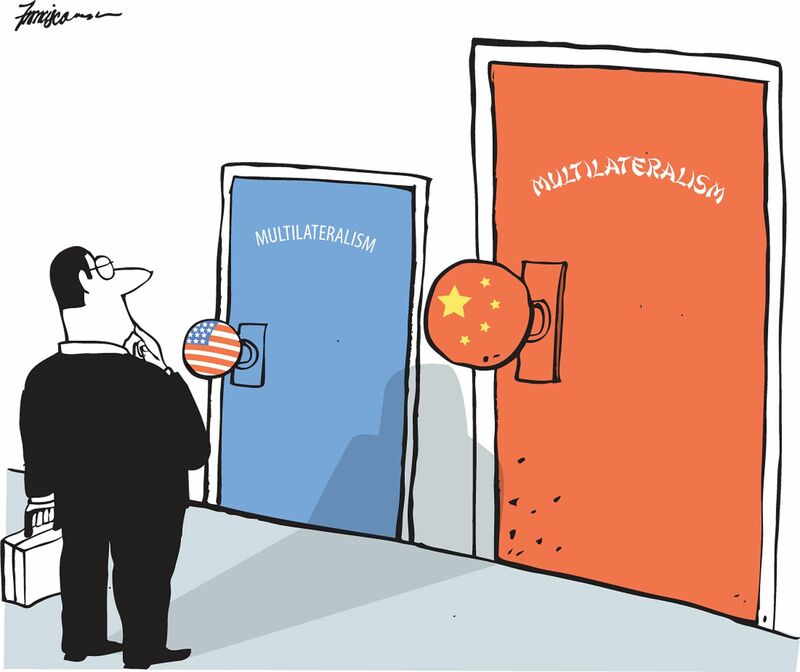 China's vision of multilateralism will certainly serve China well, allowing it to expand its economic and geopolitical influence in a manner that will become ever harder to resist. Whether this will be good for the world remains to be seen. Eswar Prasad is a professor of trade policy at Cornell University and a senior fellow at the Brookings Institution. Jonathan Eyal is away. His Global Affairs column resumes on Sept 25.